Local businesses have been building brand awareness for centuries u2014 take for instance this 1837 advertisement from Peach St. 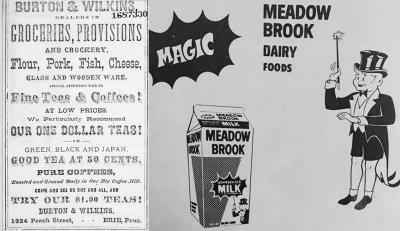 Grocery (left) and 1966 print spot for (the recently closed) Meadow Brook Dairy. In the 1870s, Hamilton Child compiled a directory of prominent businesses throughout Erie County, Pennsylvania. He made a career out of this: deploying canvassers into counties and regions to compile these directories, painstakingly collecting details on products, owners, output, and employment. Today, these directories provide an interesting glimpse into these 19th century communities and the goods that were produced there. During the time of publication though, the directories served as the ultimate 19th century "Shop Local" book. Erie County residents could utilize Child's directory to find products of all kinds being produced around the county. There was the Presque Isle Spice Mills, which roasted and grinded over a ton of coffee and 200 pounds of spices each day. The Erie Paper Mill produced daily over two tons of manila paper. Numerous breweries — Baker's Ale Brewery, Downer & Howard's Ale Brewery, The Eagle Brewery, Koehler's Brewery, and others — made thousands upon thousands of barrels of beer annually. There were businesses manufacturing candles, soap, nursery beds, pipe organs, chairs, carriages, cheese, flannels, tools — and frankly, just about anything else one might have needed in the 1870s. If one searches online for "antiques" and "made in Erie, PA" or visits one of the area's many vintage shops nowadays, one will be exposed to a near-endless amount of old Erie brands: Griswold cast-iron pans, aged wrenches made by Erie Tool Works, classic toys from Louis Marx and Company, and Koehler beer bottles and memorabilia, to name a few. A quick eBay search demonstrates that many of these Erie-made antiques have quite a following among collectors, particularly Griswold Manufacturing, where people pay big bucks for their pots, pans, kettles, and other cast-iron items, which were produced in Erie between 1865 through 1957. The branding power of "Made in Erie" still resonates in the region today. It's satisfying to glance at a label or flip over cookware and see one's own hometown. Like Pittsburgh with Heinz Ketchup (my Pittsburgh-raised wife would never look at me the same if I came home from the grocery store with a bottle of Hunt's), Erie residents are just as passionate about their locally-made products. Growing up, this local-brand loyalty was embedded in my psyche at a young age. My holy trifecta of local consumables when I was a kid were Smith Hot Dogs, Troyer Farms Potato Chips, and Meadow Brook milk — and while only one of those remain, my local brand loyalty remains strong. There has certainly been a resurgence in caring about where our products are made. For those who can afford the few extra bucks, for instance, the regional craft brewery renaissance has reminded us of the benefits of drinking local. Many others are more interested than ever about where their food comes from, inspiring new city ventures such as French Street Farms, Cake Zen, and the growing fame of the locally-made D'Lish Chicken Wing Dip. Brand loyalty on the national level often relies on clever marketing strategies, but when it comes to goods manufactured in one's own region, the loyalty offered has less to do with marketing and more to do with pride. Who hasn't argued over our region's best wine or chocolate (spoiler: they're all delicious)? Who doesn't have their go-to local bakery for cookies and cake and pepperoni balls? When you slip on a t-shirt from Erie Apparel, KRU, or Iron Empire and go out in public, you feel more connected, more part of the community. These days, the spirit of Child's directories live on in things like Erie's Shopping Guide, a locally-focused aggregator assembled by David Steele and Emily George, available for free all over Independence Hill and throughout the city. There are the economic reasons to support local brands, but there are also the cultural: local brands are part of what makes each city, each town, each community unique. For those local products you love: share your love of them with others. Skip the $5 Hallmark card and gift someone with something locally-made instead. For those products you have yet to experience yourself, give them a try when you get the chance. You might find yourself a new favorite brand.